The name you see listed here is a reflection of the Owner name on the Master Property Record as of the preceding January 1 lien date. The lien date was changed from March to January in 1997. If you are a new owner, this name will be the previous owner of the property. Here you should see the street address of the piece of property being taxed by your tax bill. If you do not own property at the address listed here contact the Treasurer-Tax Collector’s Office at (805) 654-3744 to acquire the correct tax bill for your property, and contact the Ventura County Assessor’s Office at (805) 654-2181 to correct the Master Property Record. Unimproved (vacant land) property will not have a situs address. Listed here is the last known owner of record. If you purchased the property located at the address listed under situs/location, and your name is not yet listed as current owner, it may be that the Master Property Record has not yet been updated by the Assessor’s Office. Master Property Records are updated within three to six months of the close of escrow. 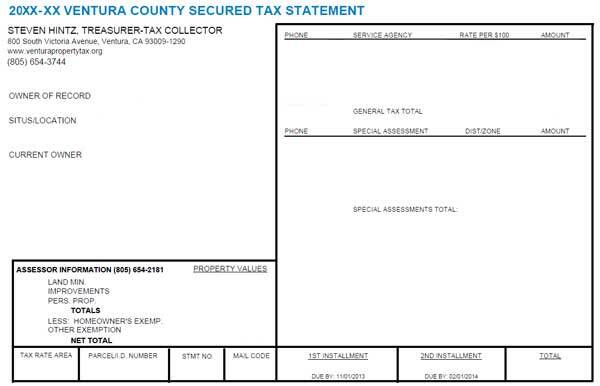 The numbers listed in this box represent the values that the Ventura County Assessor has assigned to your property, as well as any exemptions (i.e. homeowner’s exemption) for which you qualify. Property values include the value of the Land, Mineral Rights (if applicable), and Personal Property (Unsecured property such as Trees and Vines in orchard farms). The Net Total is the total of all property values listed, less exemptions. It is the Net Total Value that has been used by the Auditor-Controller to calculate the amount of tax due. This number is used to identify the property. This numbering system was invented by the Assessor’s Office and includes the map, book and page number of the parcel. This is the number of your bill. It is like an invoice number. This is an area where coding generated by the computer has been placed. When a lender or property owner has requested a large number of bills, they are assigned a code. The Ventura County billing system then groups all the bills with that code together for one mailing to the requestor. Governed by the Revenue and Taxation Code for the State of California, the amount calculated on this line is equal to 1% of the Net Total (See Property Value Box) of the assessed value of your property. For questions regarding Proposition 13 contact the Ventura County Assessor’s office at (805) 654-2181. The items listed here are approved by the voting public prior to appearing on your tax bill. For information regarding any of your bonds, contact the taxing district at the telephone number provided next to the bond name on your tax bill. 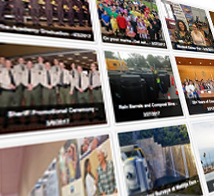 The Ventura County Tax Collector has no jurisdiction regarding the bonds listed on your bill. Unlike Voter Approved Bonds (listed above), Special Assessments are not approved by the voting public prior to appearing on your tax bill. These charges are submitted for collection by separate taxing entities to cover the costs not provided by Proposition 13 for varied services. Some of the services these districts are billing are for federally or state mandated programs, although not all of them are. For information regarding any of your special assessments, please contact the taxing entity at the telephone number listed on your tax bill. The Treasurer-Tax Collector has the obligation to collect these monies, however the jurisdiction for these assessments are with the separate taxing agencies. This is the Total amount of tax you will be paying for the fiscal year. The amount due here is equal to the total amount calculated for Proposition 13 tax, all voter approved bonds, and special assessments. The Treasurer- Tax Collector cannot accept less than the total amount due for each installment. Due dates are established by the State of California Board of Equalization. This is the amount due for the first installment. The first installment of your tax bill is due each year, as defined by the Revenue and Taxation Code for the State of California, on November 1st and becomes delinquent if no payment is received the end of the business day on December 10. The Treasurer-Tax Collector does accept a postmark of December 10. However, we recommend that you carry your payment into the Post Office and have the stamp hand cancelled if you decide to wait until the last day. Postmarks of later than December 10, (or the first business day following if December 10 falls on a Holiday or weekend) are subject to a ten percent penalty. This is the amount due for the second installment. The second installment of your tax bill is due each year, as defined by the Revenue and Taxation Code for the State of California, on February 1st and becomes delinquent if no payment is received by the end of the business day on April 10. Like the first installment, a postmark is acceptable. However take proper precautions to have the stamp hand cancelled if you opt to wait until April 10 to make your payment. Delinquent second installment tax payments are subject to a ten percent penalty plus a $30.00 administrative cost.